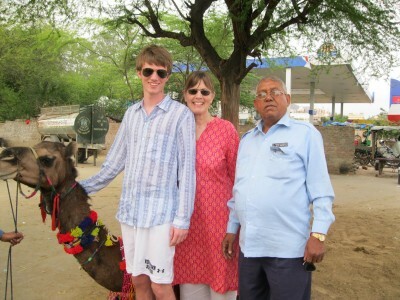 A camel ride seemed like the perfect way to celebrate my son’s 20th birthday. I was excited. Who wouldn’t love a camel ride? 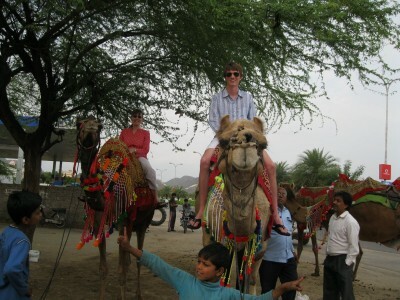 Will looking cool on his camel. 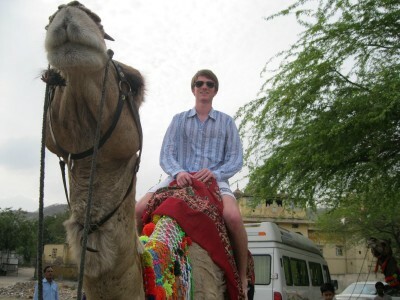 Will rode his camel with great style. My favorite part of this picture is not the memory of my ‘distress'; it’s Tara, our wonderful driver in the blue shirt on the right. Having made the arrangements for us, I think his expression shows great concern for ‘madam’. Starting to relax, but pleading to go back. 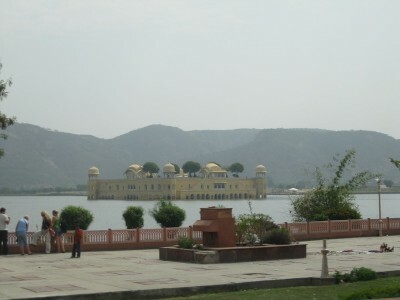 If only I could keep my focus on the serene view of Jal Mahal, the water palace just across the road. They’ll soon be opening the long shuttered royal retreat for dining. Can I get there by camel? Relief! The long 15 minute ride was over…..
Clearly, a terrific time was had by all. Tara seems very proud of us. 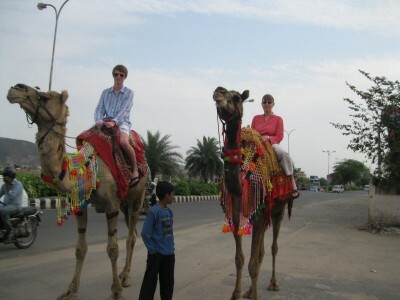 And Will, to his great credit, never made a snide remark about mom’s total freak out during his birthday camel ride. 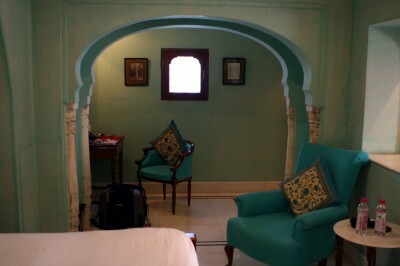 Samode Haveli is my favorite place to stay in Jaipur. Please don’t tell your friends about it! 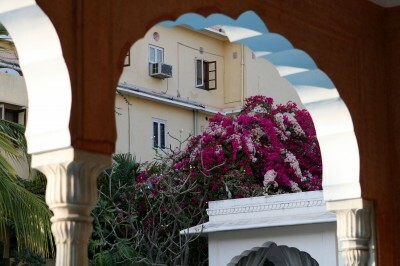 The Haveli sits inside the walls of the Pink City and was the summer house of the Maharajah of Samode, used by him and his entourage when he came to the city for official visits to the Maharaja of Jaipur. 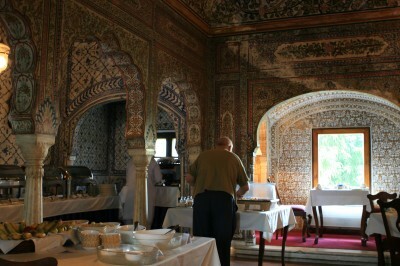 The larger Samode Palace is outside the city and also a hotel. 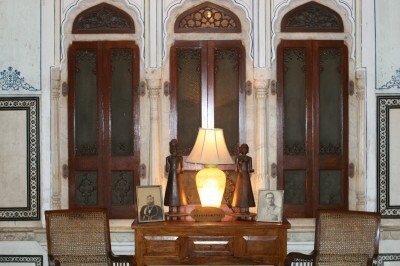 The Maharaja’s heirs live at Samode Haveli, with their families and dogs, on the upper level. 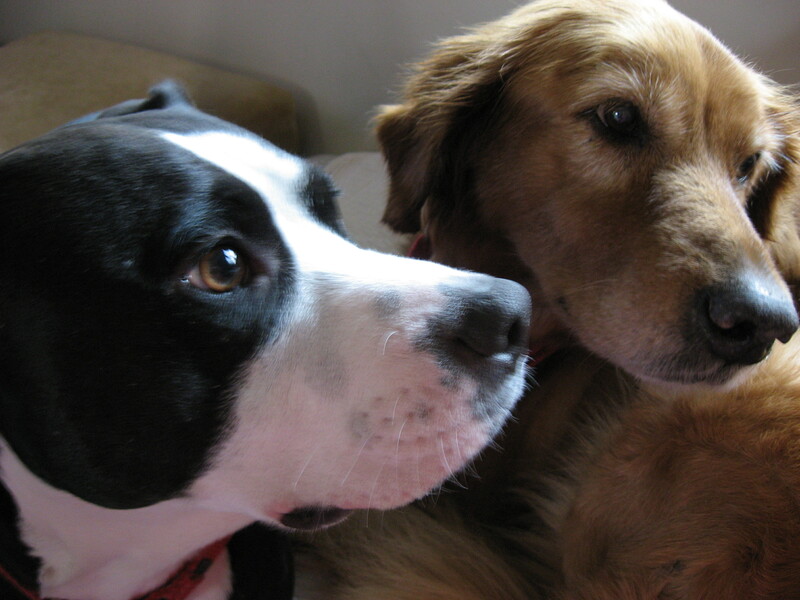 In the afternoon the family dogs are exercised; one a Jack Russel-like high energy guy and the other a mellow lab-like guy. High-energy-guy can also be found hanging around the main courtyard meet-and-greet area, keeping track of things but totally disinterested in guests cozying up to him. He’s busy with other concerns. High-energy-guy often hangs out here. The haveli is lovely and serene; the perfect escape for Maharani wannabes. Narrow passageways, many of which open onto small private courtyards, balconies, or a central courtyard, lead to rooms which reveal the status of the original occupants. You can spend some downtime fantasizing about palace intrique while you watch cricket on the telly. And yes, the haveli has installed that maddening Indian electrical system with a million switches requiring patience, or an excellent memory. 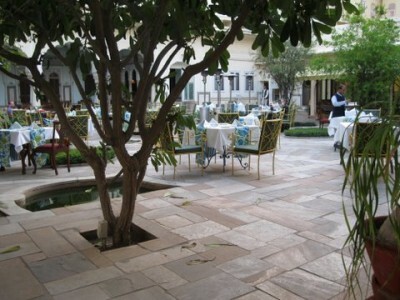 After a brief seclusion (this is a good thing to do after the streets of Jaipur), head to the pool for tea and biscuits. My favorites are McVitites Digestives (just bought a package here in the U.S. and paid over $6!) Usually Samode serves a more refined biscuit with tea. As the sun lowers, birds start to arrive for their overnight roost in the trees and kites rise in the sky. You might see monkeys hanging out on the roof and evidence of family life is found in the pet rabbit and guinea pig hutch close by. I love this aspect of Samode; hanging around with the pets of royal linneage. Most people eat dinner late in India, but for me a belly full of curry doesn’t make for a restful sleep. 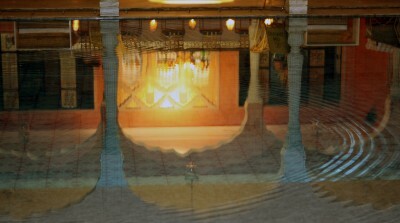 The central courtyard, where dinner is served at Samode, has a series of small lit pools and a romantic atmosphere. The waiters step deftly around the pools and traditional musicians perform the music you want to hear while you sip your Kingfisher beer and munch on garlic nan. The food is good, if you stick to Indian, and the atmosphere is perfect. Bring your shawl for the cool nights. You can close out the evening back at the pool. There are cabannas for lounging with your honey or your book or your nightcap. …….and Samode waiting for you at the end of the day. 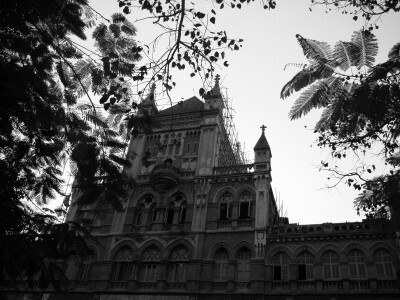 Just down the street and around the corner from the Taj Hotel in Mumbai is my favorite boutique hotel. The Gordon House Hotel has more than one thing to boast about. The location is perfect. 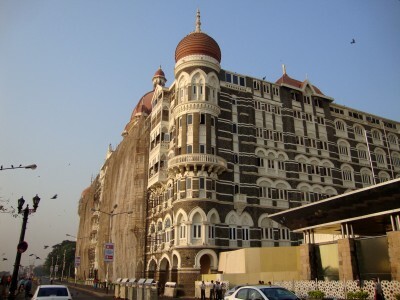 It’s within two blocks of the Taj, four blocks from Leopolds and around the corner from touristy street shopping. There’s a coffee house and a single screen theatre (a dying breed) within a block. The staff are great. But the best is what’s downstairs! All Stir Fry is on the street level and here you can see your food cooked in front of you. It’s so comforting! Breakfast is also served here and it’s all up to par. The paratha are especially good with scrambled eggs. GH used to serve breakfast on the roof in a small, but fun, room with a south India atmosphere. The roof is now reserved for parties. But wait, there’s more! On the first floor is Polly Esther’s. 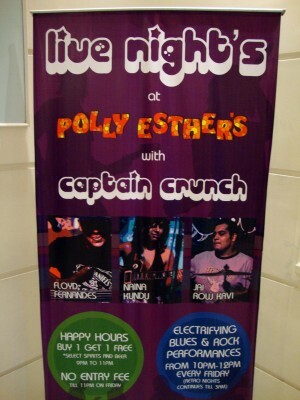 If you aren’t exhausted from a day on the streets of Mumbai, you can party with the young crowd at Poly Esther’s and you’ll only have to stagger upstairs to bed! I admit, I haven’t done this. I always ask for a room on the 4th floor to be as far from the music as possible. It’s never been a problem and I like coming ‘home’ to the neighborhood hot spot. This is also a part of Colaba where a morning walk rewards you with great old homes and buildings, aged by sea air and time. Oh, I guess I should say something about the guest rooms at Gordon House. Not big, but big enough, comfortable bed, clean, and all the usual gadgets. It’s not the Taj, but you’ll save at least $200 a night, and with the Taj so close you’ll feel like it’s in your backyard. 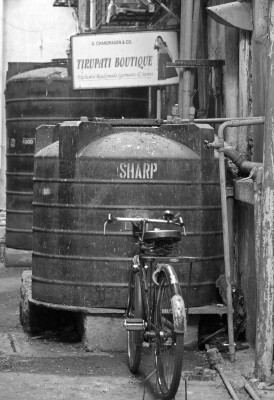 One last thing, there’s great shopping in the alley next door. The kind of thing I love about India. Mumbai isn’t for everyone. A mega city of 18 million people, its overwhelming congestion, noise and dirt can be a real turn-off. But I like it. It has the same kind of energy that draws people to New York city. I admit that I hardly know it. 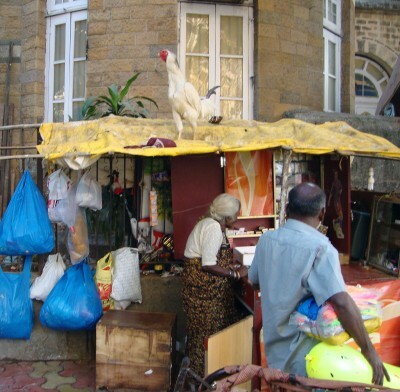 I cocoon myself in Colaba and mostly head out on foot. 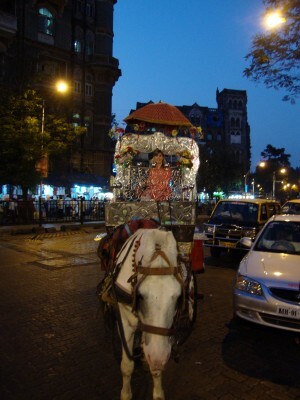 Car travel is limited to a trip to Anokhi and now to Malabar Hill, where Hansiba has opened a shop. It had been two years since my last visit. There are many changes. A new toll road by-passes some of the congestion on the way to the airport, though it can still take over an hour if a VIP, like Rahul Gandhi, is expected in town. More public transportation projects are underway and several million people have been added. The international airport has a new terminal and multiple security checkpoints (you’ll need to leave plenty of time for this). I was anxious to see The Taj Hotel. Like millions of people I watched through that night and into the morning. and the staircase is still dizzyingly beautiful. 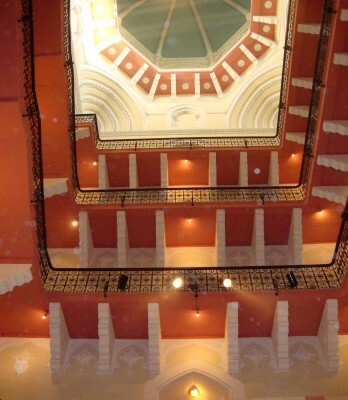 Looking up the staircase, to the ceiling. Luckily you have to walk up a flight to the Sea Lounge. You’ll want to have your picture taken as you descend. The panoramic view of the harbor and Gateway to India from the Sea Lounge is partially obstructed by scaffolding and netting where repair work is still underway. 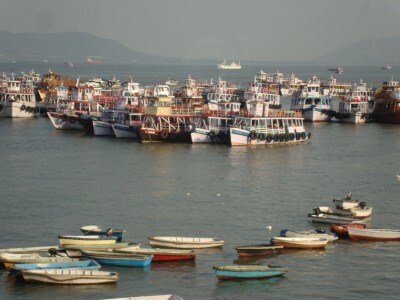 But in the adjoining room I took this picture of the colorful boats waiting to ferry pilgrims and visitors to Elephanta Caves. Indian Princess on the hoof. and all guests are welcome. This is Iqbal. I don’t know how he would feel if I said to him that I find him adorable. This is me, wishing I was as talented, and cute, as he (him?). And this is my souvenir from my trip to the Anokhi Museum of Hand Printing. Iqbal encouraged me with a warm smile and thumbs-up as I tried to steady my hand and align the blocks. Only toward the end was I able to place a block without him laying his hand over mine. If you want to see Iqbal in all his printing glory watch his ‘you tube’ video. Iqbal and his lowly apprentice. And this is Majib. Look at his masterpiece! 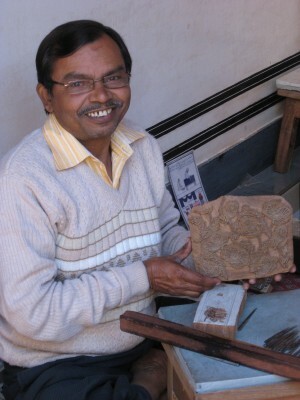 His intricate carving of the wood block is indeed something to be proud of. Together he and Iqbal were the highlight of my trip to the Anokhi Museum, but there are many other reasons to visit. Majib and his handcarved block. The history of block printing, the story of Sanganer (which is much of the history of block printing), the collection, and the beautiful Haveli that houses it make the short excursion from Jaipur well worth your time. You’ll find the museum by the Kheri Gate of the Amber Fort. 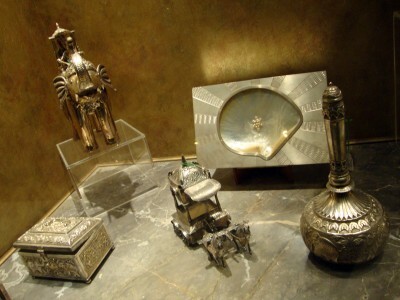 It has been lovingly restored by the founders of Anokhi. You can visit the Fort (truly awesome) in the morning and then head to the museum. While there we watched an engrossing video about the Indigo dye making process. The producer compared it to wine making; harvesting the Indigo plant at just the right time, fermenting until just the right color and smell, oxygenating, distilling, forming and drying (not too fast) the dye blocks. All in all, a long and labor intense process. The Indigo dye from the featured farm is prized by international buyers (and Anokhi) for its exceptional quality. Leaving the video room and passing through a narrow doorway we ran into Suki from Cincinnati. She’s at the museum several times a year to curate the exhibits. She’s lively and great fun to talk with and her favorite time to visit Jaipur is August! I’m hoping she’ll be in Jaipur the next time I visit so we can have a meal together. It’s funny thinking about meeting up in Jaipur when we’re both from the U.S. I have more pictures and when the camera cord issue is solved I’ll get them posted. Shopping’s a hard job, but someone’s gotta do it! 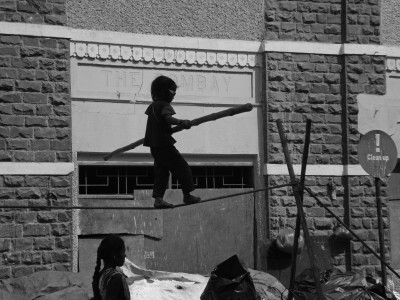 Here’s a photo from “Day One: On the Streets of Mumbai”. First up, Hansiba, which is the label for Self-Employed Women’s Association (SEWA). I was delighted to learn that they had opened a shop here in Mumbai. I’ve shopped them in Delhi before. Wonderful Gujarati embroidery. Hilary Clinton visited the shop when she was here and they’re proud of that. Then onto Tulsi, the shop of Neeru Kumar. Georgeous weaving. A little hard to find but Sadarauddin got us there in his spiffy new teeny, tiny car, perfect for Mumbai traffic. How many cabs are there in Mumbai? 30,000 plus or minus. After lunch at All Stir Fry, and a recuperative nap, we hit Fabindia. It was fabulous! 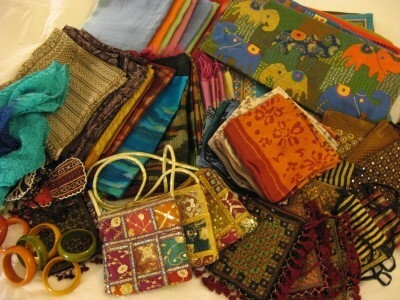 I got beautiful silk scarves and stoles and fun purses that I hadn’t seen there before. The place is packed with shoppers. They have neat shopping bags made out of newspaper and hand lettered. And last, my favorite shopping experience, the “Golden Causeway”, street shopping where you’ll see all the tourists and someone’s always trying to offer you the best pashmina on the subcontinent. I bought enammeled earrings and bangles….clink, clink, clink. My grandmother Edna started her travel business, Global Tours, at the age of 50 in Peoria, Illinois. She wanted to ‘see the world’. She did, leading tours to all the countries on her bucket list except China, which wasn’t open when she stopped traveling at the age of 80. She would sometimes layover in Los Angeles, where we lived, and she always arrived dressed in her travel clothes; three-piece suit, hat, heeled shoes (about 2 inches) and stockings, which I know were held up by her long-line ‘merry widow’. When we lived in India she came to visit, arriving in full travel regalia. 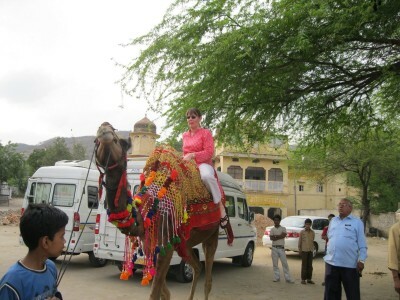 We toured India together and in the photo of us riding the elephant at Amber Fort in Jaipur, she is DRESSED! Gram never, ever wore pants in her 95 years. And when she died I think she probably had on her ‘merry widow’. When she fully retired at the age of 90, and moved back to Peoria from LA (where she had come to live for a decade to enjoy the warm weather) she put on her stockings and ‘merry widow’ EVERY DAY before reading the Wall Street Journal. Wow! I’m all about comfort when I travel. There’s not a buckle or zipper or button or snap or clasp on me, except for some jewelry. One of my gripes when I travel by air is how my hair gets full of static. So today, I’ve rubbed a dryer sheet (unscented) over my hair and clothes. Another gripe is of course the seats. So today, on my way to mid-eighties and high humidity in Mumbai, I’m taking my long (to the calf) down filled jacket to be my feather bed for the 14+ hour flight. It squishes up nicely in a suitcase. I’ve got my chocolate; I plan to eat one an hour. And my eye mask, where I can hide and not see all the people who are SLEEPING when I’m not. My technique for long flights? Do as Wilbur the Pig did that morning in the barnyard; from 9-9:15, scratch back; from 9:15-9:30, visit toilet; from 9:30-11, watch movie……you get the idea. A well planned trip. Talk with you on the other side! 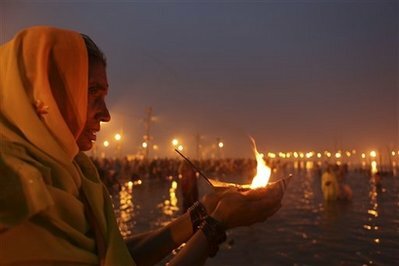 Have you seen the PBS series “The Story of India”? The host and producer, Michael Wood, has such infectious enthusiasm for his topic that even if India is not at the top of your list, I guarantee you will enjoy at least one episode, but try to stay on through the whole series. It’s fantastic! It will probably come around again, or you can buy the DVD set. Michael Wood has also written a book called The Story of India. I’m not a history buff, maybe because I think to be one I need to hold dates and events in my mind so that everything gets perfectly aligned. But that’s his job, not mine. I get to sit back and let the sense of it all wash over me while he does the heavy lifting. Allowing bits of Indian history to imbed themselves in your psyche is HISTORY in the MACRO. You grow larger, not smaller, because you become part of something big, epic, enduring; I guess in a way growing and shrinking at the same time, like the iPod Nano. I thought I would take much longer with this book when I started because I kept thinking, uh oh, better read that part again cause you’re not going to remember it. But I’ve overcome myself and it looks like I’ll actually finish it sometime this month. It’s a fitting book to take to India, so that’s fine. I do want to move onto Jumpa Lahiri’s newest collection of short stories Unaccustomed Earth, but will insert a book about Turkey inbetween so I’m primed for my trip in April. I’m going to India next week! At this point, I’m all aflutter with anticipation. Excitement about my absolute favorite thing, waking up that first morning in India, gets me through the long hump of a 14 hour non-stop flight. This last week I make a list. Even though I’ve been to India many times, and even though almost anything can be found in India, I don’t want to spend my time looking for stuff on my first day. 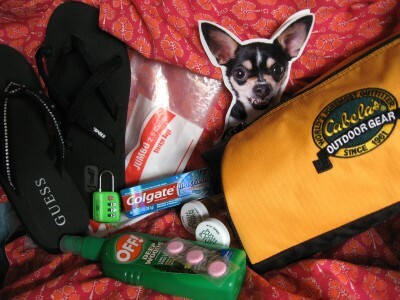 Here’s my gotta-have-stuff when I travel to India. You can play “Where’s Waldo” and look for it in the photo. 1. The right shoes. I was just looking at photos from an ’06 trip to India when I still did the bulky white tennis shoe thing. They scream American tourist. But that’s not why I changed to sandals. India is dusty and yes, in many places I will have to step carefully. I wash my feet, duh, and sandals (I love these Teva’s; you can get them at DSW for $24) every night. That way I’m not collecting a suitcase full of nasty socks and wearing the same dusty shoes every day. Plus, and this is very important, India is a country where feet are shown. I’ll get a pedicure before going, so my dusty feet will look their best. 2. Duffle bags. Every ounce counts, so I don’t want to use up precious quarter ounces with heavy suitcases. I take one sturdy suitcase and two light-weight duffles. The rolled duffles go in my suitcase for the trip over and carry textiles back. I just got these new gold ones on line from Cabel’s. 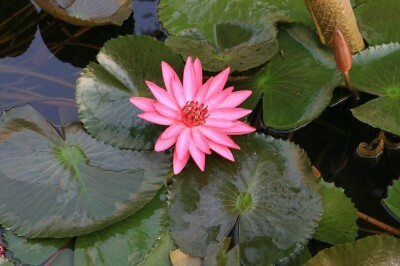 I love the color. 3. Travel size toothpaste. I was astonished to discover that not all travel toothpaste is the same size! (It’s the little things.) One ounce lasts about a week. There’s a huge difference between .75 and 1 ounce; probably 2-3 brushings! Look for this one. 4. Ambien and Cipro. I never down an Ambien on the flight because I don’t want to drool in public. But it gives me a solid 5 hours of sleep the first and second nights in India. I don’t want to spend my time sleeping in India, but I do want to sleep. I still use Cipro for, you know, though some people recommend other antibiotics. This works for me, so far. 5. Off. I don’t take anti-Malarial medicine because I figure why poison inside and outside? There are other mosquito-borne-nasties in India (I hate the idea of getting Dengue) so I need to cover with Off, or something. The place where I’ve seen the most mosquitos? The international departure lounge at the Mumbai airport. Go figure. 6. Pepto. This is helpful not only because exotic food can be a little unsettling, but three days into eating dal, I usually want to slow down. Pepto does both. 7. Small combo lock. I lock my suitcase during the day. I don’t travel with any valuables but sometimes I buy them along the way. Keeping the combo simple helps my feeble mind and just having the lock will slow down any snoopers. 8. Photo copies. I carry photocopies of my passport plus front and back of credit cards. I lock these in my suitcase during the day. I always keep my passport with me because some merchants want to see it when I’m making a large purchase. This year I might need it to get into the Taj Hotel in Mumbai. Credit card hint; Capital One is the only card I use when traveling because, so far, they don’t charge an overseas transaction fee. Makes a difference. 9. Large plastic bags. I mostly use the 2.5 gallon size. I take alot of these and fill them with my purchases for the trip back. They’re also good for undies, which relieves my fear of seeing something hanging out of my suitcase as it travels around the luggage carousal. My luggage often has an ‘inspected by TSA’ sticker on it. 10. Cotton clothes. I don’t wear synthetics in India. Cotton is king there and with good reason. You know those wrinkle free travel clothes? Heavy and clammy. It’s possible to pack cotton without looking all wrinkled on the other side. I, of course, pack Anokhi, what else? Welcome to Raga Rags new Blog! I’ll get working on the first post after I get more coffee and walk the dogs.